409. The floral organs. 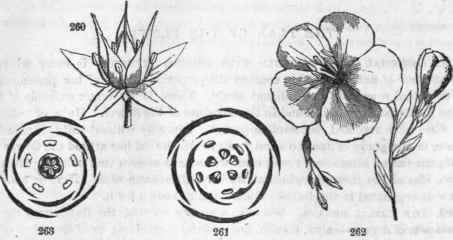 Wo have already seen that the flower may consist of four sets of organs - calyx, corolla, androecium, gynoecium; or of four kinds of organs - sepals, petals, stamens, pistils, each arranged circularly around a common center. 410. Symmetry of the flower. Now as the leaves of a branch are definitely apportioned into equal cycles, we naturally look for a corresponding symmetry in the flower. Each set of organs should consist of at least one cycle. And as the cycle itself may vary numerically, being 2-leaved, 3-leaved, 5-leaved, etc., in different species, so in the flower each cycle or set may bo 2-parted, 3-parted, 5-parted, eta That is, the sepals, petals, stamens, pistils, may each, bo two in number, or three, or four, or five in number, etc. Complete, having the four kinds of organs. Regular, the organs of the same kind similar, and Symmetrical, the same number of organs in each whorl. 413. Seldom realized. Happily, this our conception of the typical flower is not often realized in nature, although the tendency toward it is universal. Deviations occur in every imaginable mode and degree, causing that endless variety in the floral world which we never cease to admire. 260, bi8, Flower of Crassula lactea, regular, symmetrica], organs distinct 261, Diagram showing its plan. 262, Flower of the Scarlet Flax. 263, Diagram of its plan. 415. The flowers of Crassula, an African genus sometimes cultivated, afford unexceptionable examples, the sepals, petals, stamens, and pistils each being five in number, regularly alternating and perfectly separate. 416. Flowers of sedum. Admitting two whorls of stamens instead of one, we have a good example of our type in stone-crop (Sedum ternatum), a little fleshy herb of our woods. Its flowers are both 4-parted and 5-parted in the same plant. See also the 12-parted flowers of the common honseleek. 1. Variations in the radical number of the flower. 2. Deficiencies rendering the flower a, Incomplete, 6, Imperfect, c, Unsymmetrical, dt Organs opposite. 3. Redundancies, a, In the multiplication of organs, b, In appendicular organs. a, By cohesions, 6, By adhesions. 5. Irregularities of development, a, In homogeneous parts, b, In the receptacle. We shall consider these several topics in their order. 419. Exogens and endogens distinguished. Pentamerous (5V) flowers, like the rose, flax, when each whorl is (naturally) 5-parted, are more generally characteristic of the exogenous plants, 3V flowers of the endogens, as the lily, Trillium. The flowers of Fuchsia are 4V, of Circaea V, and of Hippuris 1 V.